The OCF boasts two days of incredible events including educational climbing clinics for all abilities, stewardship and service opportunities, equipment demo's, climbing competitions, and inspiring keynote speakers. The OCF brings together climbers, educators, retailers, and top companies to carry on the rich climbing tradition of Ogden, Utah. 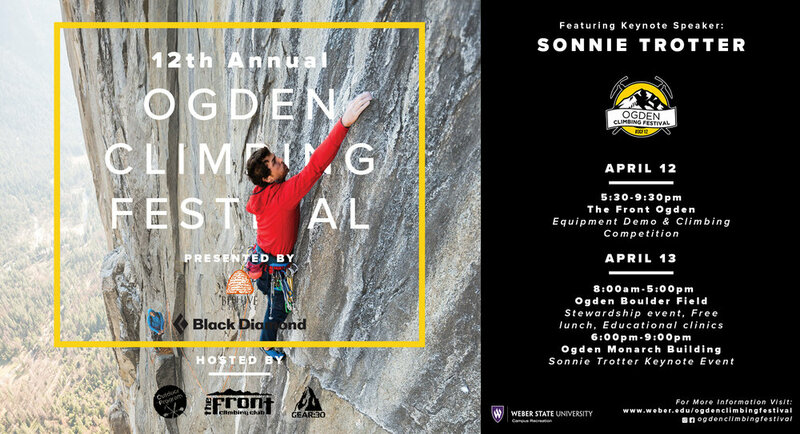 "When we started the Ogden Climbing Festival 12 years ago I would have never imagined its success. Ogden, Utah sits at the base of beautiful and iconic rock walls, home to a rich climbing history pioneered by the Lowes. You can't help but look up at the rock walls above Ogden and not dream of adventures there. The Ogden Climbing Festival is a community event that focuses on education. From beginners to professionals there is something there for everyone. Sonnie Trotter OCF12 Keynote Speaker.